Get the entire field delivering with the productivity of the top 10%. Ensure best practices are followed and escalation issues are reduced. Eliminate the time spent populating service reports and forms. Drive reduction in time on site. Recapture 4 weeks/year for each and every field tech for higher value use. For the first time get a detailed understanding of field's actions and machine performance. Automate knowledge base population. Create targeted training. All with zero incremental cost. Real time hands/eyes free platform that transfers mission-critical between mobile workers and enterprise systems. Eliminate manual documentation with a virtual admin filling in forms and documenting field activity. Insure compliance with best practices with a virtual supervisor doing the work with you. Generate actionable metrics for targeted workforce and machine performance. 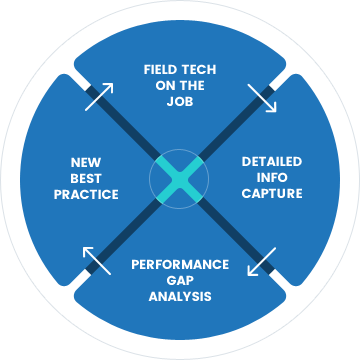 Zero cost workflow and knowledge capture from the field, formatted for analysis and distribution.